James F. Fairman, AIEE President, 1949 - 1950, elected vice president on Consolidated Edison Company of New York, Inc., and supervised electric and gas production and operation. James F. Fairman (A '20, M '27, F '35), vice-president, Consolidated Edison Company of New York, Inc., New York, N. Y., was AIEE president from 1949 to 1950. Born in Big Rapids, Mich., on April 8, 1896, he received his bachelor of science degree in electrical engineering in 1918, and his master of science degree in 1921, both from the University of Michigan. After taking the graduate student course of the Westinghouse Electric and Manufacturing Company, East Pittsburgh, Pa., he returned to the University of Michigan, and served as instructor in electrical engineering from 1919 to 1922, when he was appointed assistant professor. In 1925, he joined the Brooklyn Edison Company as an assistant outside plant engineer. In 1926, he became a full-fledged outside plant engineer, and later in the same year assistant electrical engineer. He was appointed electrical engineer of that company in 1932. In 1937, he became electrical engineer of the Consolidated Edison Company of New York, Inc., and in 1941 was appointed assistant vice-president for design, inventory, purchasing, and stores. On December 26, 1945, he was elected vice-president of the company and is in charge of electric and gas production and operation. Busy in AIEE activities, Fairman has served on the following technical committees: education, 1941-42; electric machinery, 1936-37; and general power applications, 1934-36. Further, he has been chairman of the New York Section, 1940-41, vice-president of the Institute, 1944-46, and director since 1946. He has served on many general committees, including: board of examiners, 1941-44; technical program, 1941-42 and 1945-47; executive, 1944-47; finance, 1944-46; safety codes, 1931-34; and Institute publicity, 1946-47. He has been a member of the committee on planning and co-ordination since 1945, and was chairman, 1945-47, when the study of organization was one of its major projects. In addition to this, he is a member of the special committee on Institute dues, and of the Edison Medal committee for the term 1947-49. Fairman served as AIEE representative on the Engineers' Council for Professional Development, 1938-44, and has been a representative on the board of trustees, United Engineering Trustees, Inc., since 1947, being at present a vice-president. 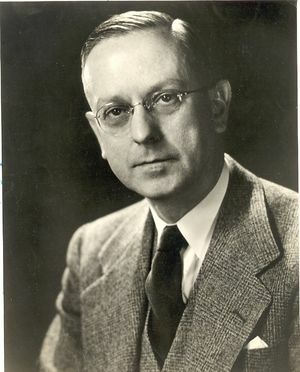 Fairman has been equally active as a member of the National Society of Professional Engineers, beginning in the Kings County Chapter where he was president for three terms, followed by two terms as president of the New York State Society, 1942-44. He served as director of the national society, and two terms as vice-president for the northeastern area, 1946-47. The author of a number of papers on professional subjects which have appeared in the American Engineer and ELECTRICAL ENGINEERING, he is a member of Sigma Xi, Tau Beta Pi, ,Engineers' Club of New York, and the Brooklyn Engineers' Club, and is a trustee of the Flatbush Savings Bank. This page was last edited on 29 January 2016, at 16:12.